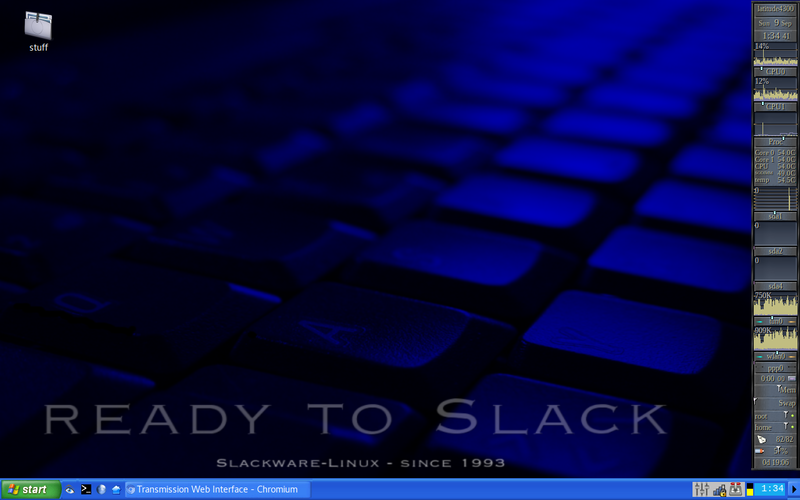 Absolute Linux is currently my favorite Slackware implementation short of my own, its use of the IceWM window manager helps keep it light and extremely responsive and the testing snapshots mean we're quite close to upstream instead of running an outdated 14.2. However, some things need fixing and sprucing up. The developer has been very responsive to the bugs found in my recent review, but I noticed later that the keyboard did not adjust to my chosen country layout although the Absolute Control Panel provides a tool for that in the system language settings. The tool actually set my language correctly to British English, if I had not already set it during the installation, but the keyboard remained stubbornly married to the US layout. Not to worry. The Slackware documentation project have some clues in Setting a Keyboard Layout. Advice for the console worked as advertised and I appended the lines to /etc/rc.d/rc.keymap as suggested. However, setting the system-wide layout in the GUI slightly differed in my case. The file 90-keyboard-layout.conf did not exist in /etc/X11/xorg.conf.d/ and also did not exist in /usr/share/X11/xorg.conf.d, thus could not copy as suggested. What was present was a file named 90-keyboard-layout-evdev.conf. Once this was copied to with cp /usr/share/X11/xorg.conf.d/90-keyboard-layout-evdev.conf /etc/X11/xorg.conf.d/ and keyboard layout adjusted to "gb" everything was fine. Just one of those little pitfalls to be aware of. Don't forget to restart the X server to take effect. Once upon a time there was a complete guide to setting up Slackware by Humanreadable which unfortunately has gone offline, with more steps than one could care for. One of them was how to customize the bash prompt and change its color. The current bash prompt in Absolute has the format \u: \w > . This displays the current user's name at the prompt. In Slackware this is \u@\h: \w\$ which also displays the host name. 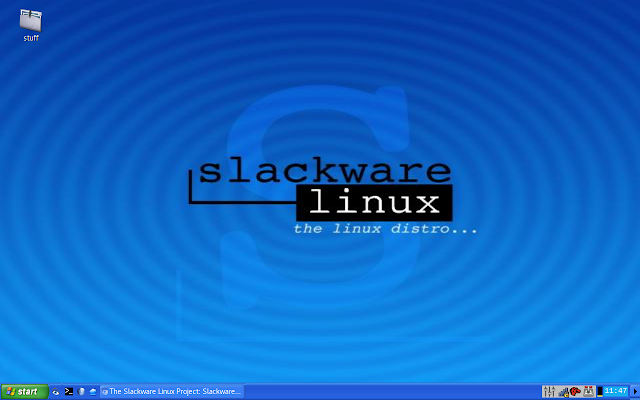 The Slackware Documentation project has a page dedicated to customizing the shell, incl. defining aliases, and also one specifically for the bash shell but for my purposes we'll go with nixCraft to modify or change the prompt and to add color to our terminal. export PS1="\e[1;34m[\u@\h @ \t \$ \e[m"
which gives us a bold but lighter dark blue, displaying user, host name and time. Combine this with a red prompt to indicate when we're using the root account. 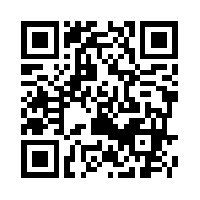 Output of PS1="\e[1;34m[\u@\h @ \t \$ \e[m"
Also interesting albeit long is PS1="\e[1;34m[\u@\h \! \j \t \$ \e[m" , which gives us the above blue prompt incl. the number of bash history entries, background jobs and the current time (Thank you Slackware Documentation and nixCraft). Use 1;36 for Cyan prompt for example. Save this prompt in your .bashrc once happy. 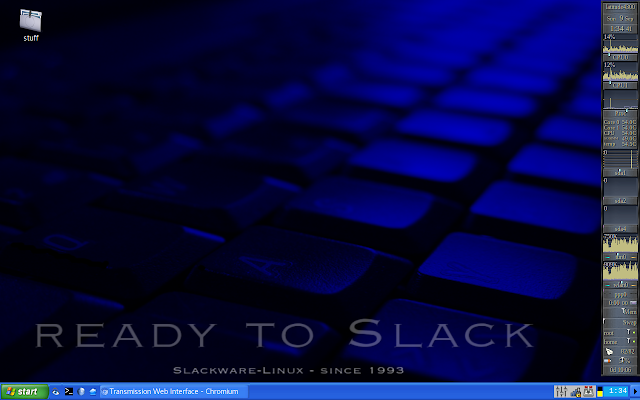 Absolute Linux comes with a variety of themes already but thse can be expanded upon if you care about desktop looks. Granted, we want to get work done but looking at something at least half decent also helps. There are 425 themes for IceWM on box-look.org, not all of which look great and some are downright amateurish so you'll be better off without them but hey, lots to try. The good thing is that themes are easy to adjust. They are stored in /home/*/.icewm/themes/theme and if you don't like a particular icon, for example for the main menu or default browser, delete it and copy another one in its place, just give it the same name. I got rid of the Firefox icon to use a more generic web browser placeholder instead. It might still look decidedly early 2000's but if we wanted to use Cinnamon or Budgie we would do that.